COMING FORTH BY DAY | Watchman - Declare What You See! The event in Chile has captivated the world’s attention with the “rising” of the 33 miners from an almost certain “grave” after being entombed for a full 69 days. While the symbols surrounding the event immediately riveted my attention, I did not feel compelled to write an article concerning the event until today. After becoming aware that a few others had written on the subject matter in an in-dept manner, I decided that perhaps it was “time” to share my own thoughts with the readers of this blog and the information that has been posted by others regarding the event. write an entire book on this subject along, I will only give a few viewpoints on the material at hand as it relates to the information disclosed in my blog and defer to other authors who provide insight into the Chilean event. The “Book of The Dead” is a book of “spells” for the “coming forth by day” (out of the place of dead spirits/Hell) into the “light of day” by those who are “raised by this ceremony” and the canting of the “spells” to bring them forth. As we have already seen, Ronald Reagan was the last U. S. President on which this “ritual” was performed, and is currently the only one who meets the criteria of the “raising ceremony” for U. S. Presidents – the most powerful world rulers of our day – to be “raised in the future”! So, how does Ronald Reagan fit into this event in Chile? Remembering the full significance of the number 33 from my previous blog articles and the facts surrounding Reagan and the number 33, it might have gone un-noticed that Reagan was age 69 when first elected President of the U. S., the oldest elected President in history. The correlations to the event in Chile regarding the numbers and Reagan are 33 and 69. Both numbers are associated with the event in Chile, Ronald Reagan and a “raising ceremony” being performed and to be performed in the future! Who is supposed to be raised? Lucifer, the Antichrist – man incarnated with Satan himself – Mr. 666! The number 69 is also “coded symbolism” for (6 x 9 = 54 which is 5 + 4 = 9) the symbolic number of the “Perfect Man” – Lucifer/Antichrist! What’s the numerical value of the book that calls for the “coming forth by day”? Yes, the very name of the book calling for the rising of the final rule ruler of last-day Babylon has the numerical value of 666! The numerical value of Jesus in the Greek language is 888, and Jesus is certainly the only “real” Messiah. Was there a symbolic “false Messiah” appearing in this massive Masonic/luciferian ritual that was unveiled upon a deceived world? The real Jesus is the “Head of the Church”, the leader of His followers and fellow workers in His ministry to a lost and dying world. The “head” and Foreman of the 33 miners was Luis Urzua, the 33rd and final miner to be rescued from the pit. What is the numerical value of his name? The numerical value of Lucifer is 444 in the Sumerian Code; and he is the one who his followers proclaim will bring “light” to the world (Illumination) – Lucifer is the “light bearer” in all Occult/Masonic/Illuminati/Luciferian doctrines and beliefs. In order to be a complete and perfect “ritual”, all elements must be in place that call for the “son of perdition” to come forth into the “light” from his hidden (Occult) world. Believe it or not, the “Occult ritual” was completed by an American! Jeff Hart, from the city famous for its Illuminati/New World Order Headquarters destination at Denver International Airport is from Denver. We have already noted in previous articles that the area code of Denver is 303 (coded 33) and 720 (coded 72). What was Jeff Hart’s role in all of this? He was the head Driller who drilled the hole and brought out the miners into the “light” of day! What’s the numerical value of the name “Jeff Hart”? Once again the numerical stamp of Satan’s chosen number 33 can be seen upon the entire rescue operation and the overall event! If you look at the following information in light of what I’ve just shared above, then the entire picture of this un-godly “ritual” of the “raising ceremony” should become crystal clear to all. These sites and videos will offer even deeper insight into the “workings of Satan” in this final hour. This Chilean Event could well be the final “resurrection ritual” performed before the appearance of Lucifer/Antichrist in the flesh! If you desire to fully understand this event, then please read and watch all of the following information provided in light of the things shared in “The Lucifer Project – Raising Antichrist” and Tom Horn’s book “Apollyon Rising 2012“. Here’s a comment on the previous article of a few things that some people picked up on immediately. Don’t miss the following explanation of the “raising ceremony” and all the graphic details of what is to come from this “trial run” of the FINAL EVENT that will deceive much of the world into believing that the “Messiah” has arrived to “save them” from total destruction. In summary of all the things shared above and in this blog, Pastor Mike Hoggard has shown a deep understanding into the these events and the “workings” of Satan to usher in his New World Order under the Beast. Pastor Hoggard starts the “Chilean Event” after a few minutes covering other topics of concern, but his insight should put most other “pastors” to shame on this subject of Satanic deception that is coming upon the world while the “Illumination” of TV sets fill rooms and offices around the globe to “program the masses” in the final hour of history! Thank you for the kind comments! My objective is to only post the things that might not be clearly understood by the observer, so I’m pleased that you now understand how the “rising ceremony” was depicted once again on the World Media Scene as a “omen” to the coming main event. This was not a “man-made” disaster and rescue, but one planned deep in the “pit of darkness”; and I’m not speaking of the bottom of the mine when I say pit! Look for even more “supernatural” events to occur in the very near future that will completely fool most of the world’s populace. Thank you so much for the great compliment! Anytime I believe that the Holy Spirit has “quickened” my understanding as to what is occuring as it relates to Bible Prophecy and world events, I will make every attempt to publish the information “as I see it” as a Watchman with the “calling” to warn others who might not understand the events unfolding before us. Be Watchful, as the time is at hand! Would you please clarify #4 on that list in yellow? I got lost there. We were going through a major family crisis when this all happened. I did not pay much attention to the miners at the time. Here’s the method used to arrive at the number 33 by the author of that article. Oh I see. When you have 9/11, it sounds like Sept. (9th month) and the 11th day. Then you have 13/11, and that did not make sense in the month/year format. Thank you for the clarity. This old brain works a lil slower these days. Ha, I just proved it didn’t I? 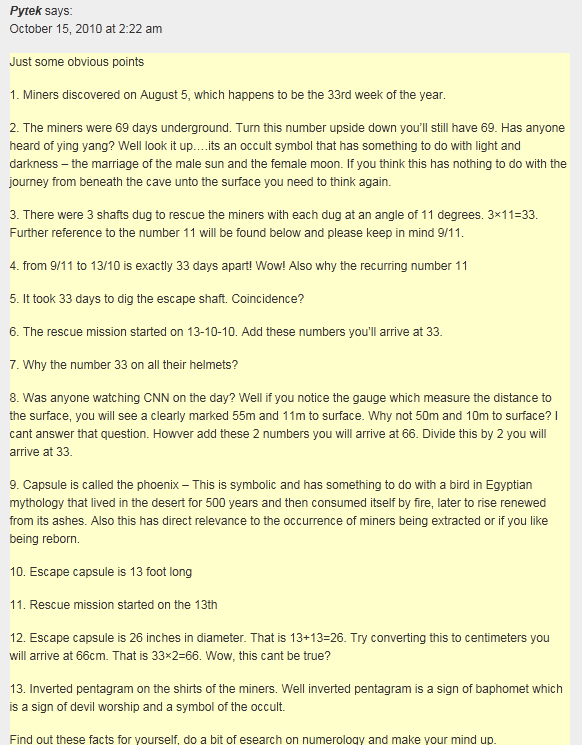 I meant that the 13/11 did not make sense in the month/day format. I apologize. I am still trying to recover from the last 6 weeks of family turmoil, and my thinking capacity is still “on hold”.